So to answer those questions and to show that you can reach your goals through drop shipping, I’ve put together this comprehensive dropshipping guide. It’s a written version of my very popular ​mini-course video series but with some enhancements. My goal is to give you a complete guide of high-ticket drop shipping. That way, if you or someone you know is curious, you have the perfect resource. Section 1: What is Drop Shipping? Section 4: How Much Can I Make With Drop Shipping? Section 5: Where Do I Sell My Drop Shipping Products? Drop Shipping is a retail method in which you don't keep products in stock. Instead, you partner with a supplier that stocks its own inventory. You transfer customer orders and shipment details to them, and the suppliers ship the order directly to the customer. Also, I know people wonder how you could actually drop ship profitably because there are many ways to drop ship. And the truth is, some ways work and others don’t. 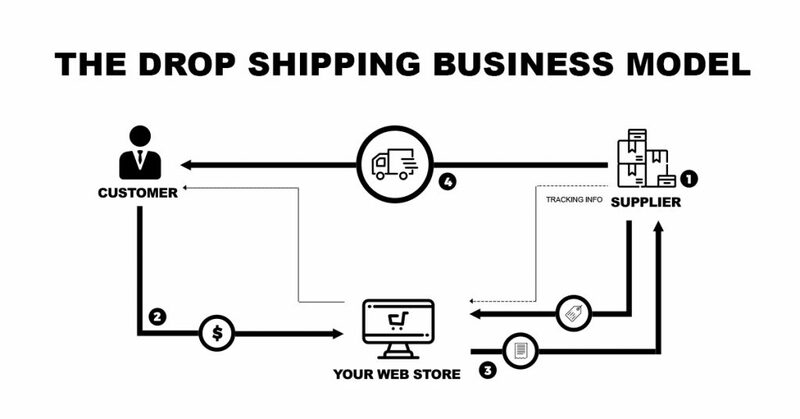 So as simple as possible, this is drop shipping in 4 steps. Step 1 - You list the supplier’s product on your store for customers to buy. Step 2 - The customer purchases something from your eCommerce store. Step 3 - You order that same exact item that the customer paid for from your supplier. Step 4 - Your drop shipping supplier ships this item directly to your customer. So your customer receives the item that they’ve ordered from you. ​To explain a little further, it all starts with building your own eCommerce store and listing products on your website. I recommend building this store on Shopify and customizing it to fit your ​target customer. But whose products are you selling? Well, these are different suppliers’ and brands’ products. You may be thinking, “why don’t these companies sell their products directly?” The thing is there are companies that only focus on innovating products that rely on retailers to sell them. That’s where you come in as a drop ship retailer, you’ll be selling for these brands who don’t sell to the public. They look for people to sell their products, to make them money, and grow their business for them. You are one of these retailers. You’ll want to focus on getting approved to sell for these different companies. After you’re approved you’ll put their products on your Shopify store. Then you will advertise to bring people to your store. Customers come to the store, and after they purchase, you contact your suppliers. Then they ship the items directly to the customer. You aren’t buying any inventory. All you’re doing is making an agreement with the drop ship supplier to sell their products on your website. You get their price lists and put their products for sale on your site. When someone buys, you place that order with the supplier. You only order the product after the customer has paid you. Then you’ll contact that supplier, and say “ship item XYZ to customer ABC.” Then they ship it and charge you. The difference between your retail price and what you pay your supplier is the net profit. From my experience, when you drop ship the right way, you’re looking at about 25 to 30 percent average net profit. That means if you sell a $1,000 item, you make $250. That’s the average I’ve seen in my experience. Sometimes it’s higher, sometimes it’s lower, but that’s a good goal to shoot for. It’s a realistic expectation. Before we go any further into how drop shipping works, what I really want to do is walk you through the different ways to make money online. That way, we can eventually get to how drop shipping is different and why I believe it’s the best way to make money online. As far as online business models go, the most popular are eBay, Amazon, and building your own eCommerce store. ​eBay is an online auction site that allows for you to sell as an individual or to set up a store, within their platform. When I first started in this business over I think almost 10 years ago now, I was using eBay and that got saturated very fast and became a pricing war. It just wasn’t worth it, so I cut that out. ​​Dropshipping on Amazon is ​risky. The window for selling products could shrink fast, and you could very likely get wiped out by an over-saturation of competition. If you’re not aware of this, you can actually go on Amazon and list your own items for sale. You could build what’s called an Amazon store. When you’re selling through someone else’s platform, whether that be eBay or Amazon or any other platform, they control the whole sales process, they own the customer and their database. They could sell other products to them and get them into their own sales model. ​Shopify allows you to create your own independent storefront. With ​this platform, you’ll have much more control​ and better marketing advantages​. Amazon, It’s a great business model. I’m not going to put it down at all, but I do prefer to have my own eCommerce stores. Again, I use Shopify to host them and the reason is that you have much more control. When you’re selling through someone else’s platform, whether that be eBay or Amazon or any other platform, they control the whole sales process​. That means they own the customer and their database. They could sell other products to them and get them into their own sales model. Those are the ​three main eCommerce business models that I think most people are aware of and the way most people get started out. So out of all of these, which do I like the best? Which do I recommend most? Hands down, Shopify. I like having ​my own eCommerce store​ and I especially like ​how simple the platform is to use. Let’s say you know how to sell online. It could be eBay. It could be Amazon. Or if you follow my advice, it could be your own eCommerce store. Your next step is finding products to sell. There are three main options and I want to break them down for you right now. The first option is to import your products. You can go to websites like Alibaba and you could find products to imports from, let’s just say China. This is actually how I started in business. Before I ever drop shipped, I was importing products. The next option, which some people recommend and I have no idea why is what’s called arbitrage. This is going to local estate sales, flea markets, or garage sales to find products that you could sell online for profit. I think this is just a waste of time and something that’s not scalable at all. In my opinion, the best option would be drop shipping. Remember that image we reviewed in the beginning of this section? Basically, you’re finding companies that have products to sell and they’re looking for people to sell their products for them (retailers like you). When you go into a store, let’s say in a shopping mall like Bloomingdale’s, they sell tons of products, right? And they’re not selling, self-branded Bloomingdale T-shirts or jeans. What they’re selling are products from dozens (if not hundreds) of suppliers and brands. So in the world of retail, there are the companies that manufacture and build brand names, and then there are the companies that sell for them. They’re the retailers. So in order to do drop shipping in a way that’s effective and scalable, we’re becoming retailers. But we’re not doing what Bloomingdale’s does in the sense that we’re holding the inventory. What we’re doing is providing a retail outlet to sell these products for brands that create great products, without keeping inventory on hand. Now we’ll go through what I’m going to call the successful drop shipping checklist. It’s a 7-step process that I use every time I create a store. And I highly recommend you use it when starting a new eCommerce store. But remember, this is only the first section. So don’t plan on mastering any of this until you read all the sections. If you eventually decide to join my online coaching program and community, Drop Ship Lifestyle, there are tons of videos on each of these topics. In the program, I give you the exact steps for building a successful eCommerce business. 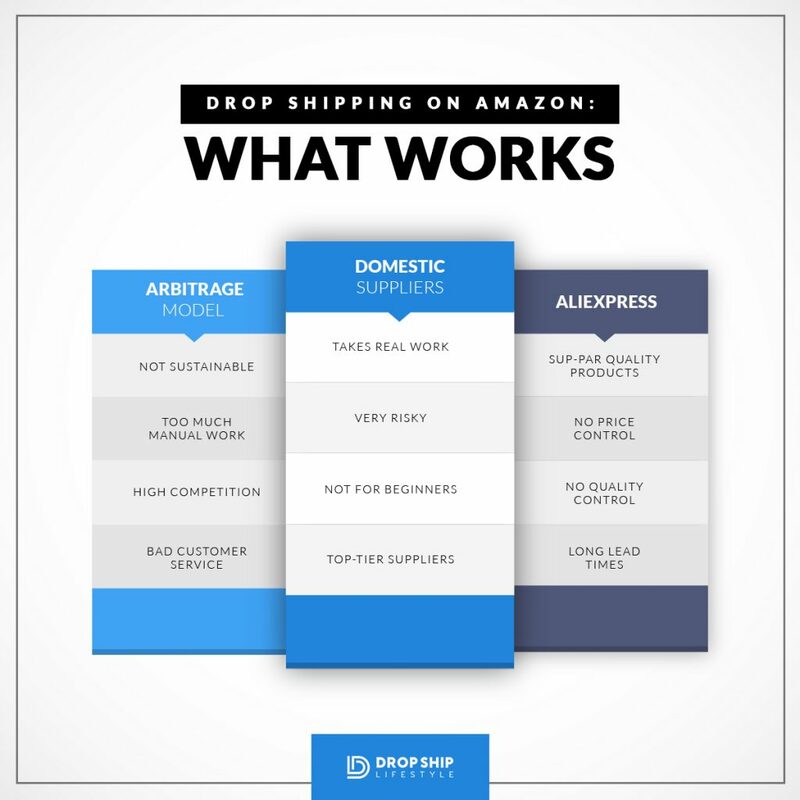 With that being said, I still want to break this down so you get a good understanding of what drop shipping is, how drop shipping works, and what you should do when you’re ready to start. That way you’re not left on your own, guessing what works. I have 10 years of experience with drop shipping, so let me give you the process that I use. First, you need to ​ figure out what you’re going to sell In later sections I discuss what meets good niche selection criteria. I also cover how to choose a niche that you could actually make profit with. The next thing you want to do is find your future competitors. So yes, you will have drop shipping competitors because there’s no niche out there that has zero competition. If you find one, it’s probably because it’s a bad niche and people don’t buy those products. In this step, you’ll look for drop shipping sites that you’ll be competing with. Basically, you’ll try to find them before launching your drop shipping store so that you know who your competition is before you even get started. You read that right, the third step is to actually build an online store. Yes, prior to ever even contacting the supplier. That’s because the good suppliers won’t approve you unless they see that you already have an eCommerce store. So this is something that you’ll want to do even before making that first phone call or sending that first email to a potential drop ship supplier. Once you have your store up, then you can start making phone calls and sending emails to potential drop shipping suppliers to get approved with them. With Drop Ship Lifestyle 6.0 we have certifications that can help with that. As well as, resources and guidelines that will make getting approved with suppliers as painless as possible. After that, you will want to optimize your website for conversions. This is where you can make all the difference. There are so many different things you could do once you have your drop ship store up that can improve your conversion rate. Your conversion rate is how many people buy versus how many people visit your site. Here’s the thing, you could have all the traffic in the world but if they don’t buy from you it doesn’t matter. You don’t need tons of traffic but you do need a buying audience. You need your website to turn those visitors into buyers. Or else, all the traffic in the world won’t solve your problem. There are a ton of different ways to get traffic to your drop shipping site and you shouldn’t rely on just one. You want to have diversified sources of traffic. That way your business doesn’t turn off overnight if one of your traffic sources stops working. After that, you want to outsource and automate. So the beauty of drop shipping stores is that it’s very easy to automate them and outsource different tasks. You don’t want to do this at first. You want to build your business, you want to run it for a while. That way you know how every step of the process works. After you do that, it’s very easy to start delegating tasks, outsourcing, and using apps that automate how your business works on a day-to-day basis. The last thing I wanted to do in this section is to give you some example of good ideal stores. That way you can see what it looks like when you properly execute the steps. Also, so you can see what an actual Shopify eCommerce store looks like. 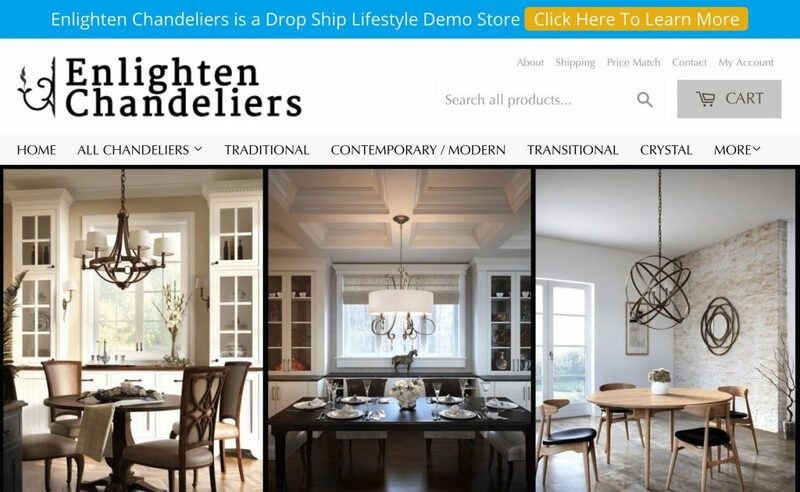 The first example of a drop shipping store is one of our demo stores, Enlighten Chandeliers. If you want to jump over to the site and check it out, feel free to. Again, this is just one of our demo stores. This would be an example of a site that went through all 7 steps. It also uses a Shopify theme that is known to convert. Definitely check it out, click on some of the product pages, and see what your drop shipping store could look like. It only cost $29 per month to build and maintain this site at Shopify, that’s it. No customization, nothing special. It’s very simple and doesn’t require help from a web designer. Let me show you another one of our demo drop shipping stores​. It’s a store that sells pet supplies like kennels and crates. Again, check it out, go to the product pages. In my opinion, this site looks amazing. This is the theme that we use for most of our stores and it’s built on Shopify. These examples should give you an idea of what an actual drop ship business looks like. I wanted to show you what a real quality drop ship store looks like, and what a store that has potential to make a lot of money looks like. Now that I’ve covered the question, “what is drop shipping?” I want to go over the benefits and downsides of owning a drop shipping business. It’s important to me to have transparency when it comes to your options. That way you have the complete picture and can decide if you want to build a drop shipping business or if you’d prefer one of the other business models. The first benefit and probably the one that’s most important to me with drop shipping is being location independent. In the last few years I’ve lived in Vietnam, South America, and Thailand. With a drop shipping business, you really can live and work from wherever you want. Drop shipping allows a level of location independence that not many of these other business models do. That’s why my coaching program is called “Drop Ship Lifestyle,” because you can be location independent. Another benefit is that there are no inventory costs. So when you’re starting out with drop shipping, you aren’t laying out any of your money for inventory. The truth is that when you’re a traditional retailer, inventory is your biggest expense. You need to physically have the products to sell but with drop shipping, you don’t. All you need is approvals from suppliers to have products. You only pay for items after you sell them and there are no warehouse costs. Now in the previous section, I wrote about how I started in eCommerce by importing. So when I first started, I actually had these inventory and warehouse costs. I was spending tons of money every month to store my products. But if you use the drop shipping business model, you’re not paying for these expenses, someone else is. All of your suppliers have their own warehouses and they’re paying to store these items. So it’s another cost that isn’t on your shoulders, something you don’t have to worry about when starting out. Another benefit to drop shipping is not having to handle returns. To be clear, if your customer wants to return an item, you’ll still have to forward the return slip from your supplier to your customer. But these items are not coming to you. If you own a drop shipping business, you won’t have returned products showing up at your house. They’re going to be shipped back to your supplier, and then based on the policy of that supplier, you’ll get a refund or they’ll ship the customer a replacement item. One thing that I go into detail within the Drop Ship Lifestyle course is how to find suppliers with low return rates. So ideally, you won’t even have to deal with emails about returns. This next benefit of drop shipping is gathering data while you’re getting paid. Let’s say that you want to build a brand in the chandelier niche, you want to sell your own lighting fixtures or chandeliers. Also, let’s assume that you want to be an importer and build your own product line. We’ll also say that you even have the money to invest in it right now. Well, before you throw money at an import business, have products manufactured, and start trying to sell them… I’d still recommend that you start a drop shipping business in that niche first. As you’re drop shipping, you’ll be learning what sells. You’ll be able to find out what your customer wants and building resources that you can use for your own product line. All while making money. Basically, you’re testing out the market while making a profit. You’ll learn what types of products sell best, what price point you make the most with, and which features customers of your niche want most. Then, after you’re successful in that niche, you can use all that data to launch your own brand with an importing business. Another huge benefit of a drop shipping business is how easy it is to scale. For instance, if you are making $100,000 a year in sales from just one drop shipping store, it’s very easy to build more stores with similar results. And the best part is that you can do this over and over again. I always recommend starting with one drop shipping store, so that you really learn the process, go through it and master it. But after you do it one time, it’s very easy to do it over and over again. The next amazing benefit of building a drop shipping business is that you’re building a real asset. Now when I first started this business, I didn’t realize it, but drop shipping stores are very valuable to a lot of people. There are a lot of buyers out there that are looking for profitable eCommerce stores, especially drop shipping stores. Because basically, these buyers could just plug themselves into your business and be making money the next day. All without having to take over your inventory or take over a warehouse. So let’s say at the low end, you build a drop shipping business that’s making you $1,000 a month in profit. That’s an amount that I think everyone could wrap their heads around, it’s very reasonable and attainable. That store could be worth as high as $20,000. So that is what I mean here when I say drop shipping is one of the best ways to make money online, it’s in large part because you’re building a real asset. On great resource for selling your drop shipping business is Empire Flippers. It’s a marketplace to buy and sell drop shipping stores in all price ranges, from a couple thousand to millions. Here are some dropshipping stores for sale on Empire Flippers. You can see that having a drop shipping business is a huge asset. Now let’s talk about some of the downsides of owning a drop shipping business when compared to owning your own brand. First off, there are smaller margins. Because you’re selling someone else’s products, profits are going to be less than if you created your own products. If you go to China and have your products manufactured you can negotiate better deals for the product price. That’s because you’re doing a lot more work and taking on a lot more of the responsibility. But your profit margins will be higher. So with drop shipping, there are usually smaller profit margins than with having your own brands. Later in this guide I will cover the exact margins, but on average, I aim for 20% profit margins with my drop shipping stores. Another thing that’s not so great about drop shipping, and in my opinion it’s probably the biggest downside, is that you have no control over inventory. Let’s say you have one supplier whose product sells well on your website, you’re making great money with them. Well, what happens if that supplier runs out of stock? What if your drop shipping supplier sells out of those items? Your customers are still going to want to order from you, but you won’t be able to fulfill these orders. You’re going to lose potential money in that situation. All because you have no control over the inventory, or because maybe your suppliers aren’t so great about managing inventory and keeping every item in stock. This is something that great suppliers know how to deal with. Regardless, it’s probably something you’ll run into at least a few times if you decide to build your own drop shipping business. You’ll run into suppliers who don’t have great inventory management and who do run out of stock and that will lead to lost sales. I cover how to spot bad suppliers in a later section and in-depth with my course Drop Ship Lifestyle. The last thing that I could really think of as a negative with drop shipping is the increased risk of competition. If you create your own brand to sell online, let’s go back to that chandelier niche, and you make ‘Anton Chandeliers’. No one else can go out and create ‘Anton Chandeliers’ because that’s your company and your brand. When we’re drop shipping, we’re selling other people’s brands that are looking for retailers. And other competitors will likely come across the same supplier and become retailers as well. So it’s competitive, but if it wasn’t competitive, it would mean there wasn’t money to be made. It would mean there isn’t a market for that niche and it’s probably a bad niche to enter. ​Those are my benefits and downsides when it comes to drop shipping. But even with the drawbacks, I always recommend building a drop shipping business. It’s what I’ve recommended to family and friends, It’s what I teach to people because it works. It’s a great way to build a location independent business, for little money, with the potential of huge returns, and that could become a major asset. There’s a lot of bad information online about drop shipping, which leads to people making costly mistakes that can kill their drop shipping business. If you want to have a successful drop shipping business, avoid these 5 mistakes. There are other smaller mistakes, but these 5 can completely derail your business before you even start. The first mistake is paying for access to a dropship supplier. They aren’t the kind of companies that we want to dropship with. That’s because they make most of their money by charging fees. These fees will come in two ways. The first will be an application fee to be approved by them. The second way will be drop shipping fees for every order you place with them. If a dropship supplier wants you to pay upfront, it’s most likely because that’s how they make their money. They aren’t interested in a long-term business relationship with you. You want suppliers that will take you on because you’re going to work together for years to come. You’re both going to make money with each other, it’s a beneficial business relationship. The next drop shipping mistake to avoid is working with suppliers who call themselves drop shippers. Don’t look for drop shippers on Google, it’s an easy way to lose a lot of money fast and for this business method not to work. I know, I know, it sounds a little counterintuitive being that you’re reading a guide right now about drop shipping. But I want you to understand, now that you’ve made it this far, that when you’re searching for suppliers you should never work for anyone that calls themself a drop shipper. You want to sell products for suppliers whose business is creating brands. So again, let’s say you’re selling chandeliers. You want to sell for a company that makes chandeliers and doesn’t sell to the public but is looking for retailers. They’re not advertising themselves as a drop shipper. The suppliers you want to work with shouldn’t be a middleman who buys products, keeps it in the warehouse, and then tries to find people to sell it for them. They are an actual brand that says they’re looking for retailers, but not drop shipping themselves. Another mistake is working with suppliers that don’t enforce MAP policies. MAP stands for Minimum Advertised Price, it means that when you’re approved with one of these suppliers, they will tell you the lowest that you can advertise their products for. This is great because you completely avoid pricing wars. For example, let’s say you’re selling baseball bats and your wholesale cost is $50. If your dropship supplier has a minimum advertised price policy of $80, then the least amount of money you can make per sale is $30. Now what happens with suppliers who don’t enforce these MAP policies is that you get into pricing wars. For instance, maybe one of your competitors is okay with making $5 a sale. So this item that costs you and your competitor $50 at wholesale, your competitor is selling it for only $55, because they want to have the lowest price. Your competitor wants to get all the sales, and they don’t care if they only make $5. This is something you totally want to avoid in drop shipping. The easiest way to avoid it when you’re first getting started is to only work with suppliers who enforce these minimum advertised price policies. The next mistake you want to avoid is competing with offline retailers. If there are competitors in your niche selling in both offline and online stores, it most likely means they’re going to have better pricing than you. They’ll have special MAP policies that apply to them only. These retailers will be able to offer much more value than you. Another common mistake is purchasing a ‘turnkey’ drop shipping business. In the last section I told you where you can buy and sell stores, but I 100% recommend you build your own. Whether it be your first store or your tenth, once you know the steps to being successful in drop shipping it’s always better to build than it is to buy. You should never buy one of these cheap drop shipping stores. They’ll never make you money because they’re just copy and paste clones of websites that dozens, if not hundreds, of people already own and none of them are making money. The worst part is that most of them are pre-loaded with products that you could find on Amazon or other big-box retailers for a third of the price. If you really don’t have the time to upload products or build your store, I do offer it as a service in my program. We work WITH you, so you understand all the steps in building a business. Another option is to hire a VA (we teach this in the program too) for a couple hundred dollars they will upload all your products for you. Now that we’ve covered some of the biggest mistakes new drop shippers make, I’d like to address some questions you might have at this point. ​How much time and effort does it take to build a drop shipping store? I’ve been building drop shipping sites, again, for years. I could do it myself in about a week to get to the very basic point where I start contacting suppliers. So for me, about a week to actually set up the store. As for the members of my Drop Ship Lifestyle coaching program, some have done it in 2 weeks, some have done it in a month, some have done in 3 months. It really depends on how much time you want to commit to it. What I will say is if you decide to work with me in my Drop Ship Lifestyle coaching program, we have a 22 video course that’s specifically about how to do this fast. It walks you through how to build your own highly converting eCommerce store with screen-share videos. It could take a week or a couple of months to build your store. It all depends on how much time you’re putting into it and if you’re following the proven steps in the Drop Ship Lifestyle system or if you’re just trying to figure it out on your own. ​How much can I make dropshipping? What will my profit margins be? This one is kind of tough to answer because it varies so much. I own stores now and have owned stores in many different niches. I’ve worked with hundreds of suppliers and I’ve been in situations where I’m okay making a 15% profit margin. I also have some suppliers where my profit margin is over 50%. So on average, I’d say with drop shipping my profit margin is right around 20% – probably a little higher. Remember, that’s net profit. Meaning, if you sell a $1000 item after you pay for the product from your dropship supplier, take into account your advertising costs, subtract your merchant account fee, and cost to ship, you can expect on average to be left with about $200 profit on a $1000 sale. To sum it up, that’s around the margins you can expect and that’s one of the reasons that I recommend selling expensive items, so every time you get a sale it’s actually worth it. ​Is drop shipping a proven business model? I’ve mentioned earlier that I’ve owned drop shipping stores for a number of years now. I started off about 10 years ago with importing. And then a few years after that I transitioned into drop shipping. To give you some idea of my success and business size, my drop shipping stores alone have done over $5 million in sales. Drop shipping has done great things for myself and many of my students in my Drop Ship Lifestyle coaching program. I recently did a survey, because we’re upgrading our program and many of my members said they are doing over $100,000 a month in sales on their drop ship stores. Having time and more money is what most people who come to me are seeking. Creating a lifestyle, passive business is at the core of Drop Ship Lifestyle, it’s why I started this program. So I’m going to answer that main question as best I can. But I’m also going to cover what you can expect with your drop shipping store; from your potential earnings to the time it takes to make your first sale. Let me start by saying that I can’t make any income claims for a couple of reasons. The first is that it’s illegal. I can’t promise that you’re going to make any amount of money at all. I can’t promise you’re going to make even a dollar. So with that being said, when you hear me give examples of other members that are doing well or when I talk about my own stores, just know that these are the results that we’re getting. But in no way does that mean that you’ll get the same. The biggest reason is that I don’t personally know you and succeeding in drop shipping has a lot to do with personality. So some of what I’ll talk about in this section is what you can do to give yourself the best chances of drop shipping success. Because yes, this business model does work. We’ve already covered that in previous sections, so I really believe if it’s going to work for you or not comes down to a few personality traits. How Much Drop Shipping Profits Per Sale? To answer this questions, I’m going to cover 2 different scenarios. Like I talked about in previous sections, I find that the drop shipping average profit margin is around 20%, so I’ll use that in these scenarios. Let’s say you’re drop shipping items that sell for $10 retail. The customer goes to your website and buy your product for $10. There’s a good chance the product will cost you around $6 from your supplier and your shipping cost will be somewhere around $2 for a smaller item. So in this scenario, you’re left with $2 profit for processing an order. In scenario 1, your profit per sale in this case will be $2, and that’s only if you didn’t spend any money on advertising. Not impressive, right? Low ticket niches like this can be ​websites like Oberlo, it’s not what I teach in my program and not something I’ve ever done. The second scenario involves selling more expensive items, what I like to call high-ticket drop shipping. You sell an item for $1000 and the item cost is $600 wholesale. Then your shipping cost is $200. NOTE: Even though the supplier is going to ship your items directly to your customer, you still have to cover the shipping cost, but you can always reduce costs by charging the customer partial amounts. But in one scenario, the high-ticket drop shipping model made 100x the amount of money than with the other one. This example gives you an idea of realistic results with the right dropship suppliers and the right niche price points. This is a pretty average scenario for me, I’m in scenario 2 and also teach this method. I’ve never sold in scenario 1. I always go high ticket niches and only work with legitimate suppliers. The next thing I want to talk about is dealing with dropshipping returns. Because it is something that people are scared of when starting a drop shipping business, or any eCommerce business for that matter. It’s common for this fear to hold people back from starting a drop shipping business. Well, a lot of different things could happen, and there’s not one answer to this. For every one of your drop shipping suppliers, there will be a different return policy. So you can’t just have a generic policy here. As you’re getting approved with different dropship suppliers, you have to read their return policy. Then your customer will have a return policy agreement with you when they buy from your dropshipping store. In the same way that your suppliers have to make a return policy, you have to make a return policy too. So make sure you know exactly how returns work with each one of your drop shipping suppliers. Then when you’re making your return policy, make sure it basically matches what your supplier’s policy says. If items can’t be shipped back after 2 weeks, make your policy that items cannot be shipped back after 2 weeks. If your suppliers charge a 25% restocking fee, make sure you charge a 25% restocking fee. It’s important that you really look over these policies whenever you get approved with a supplier. How Long Until I Get My First Sale? Let’s say you’re reading this drop shipping guide and you’re all in, you know you want to do this. You know you want to build a drop shipping business. But you’re wondering when you’ll start getting results, getting paid from your drop shipping business. There are a few different variables that factor into this. For me, when I’m building a new dropship store, I’d guess that in 1-2 weeks I could have my first sale. Are confident when you contact suppliers. If you are confident with all of this, it usually only takes 1-2 weeks before your first sale. For people that have been through my Drop Ship Lifestyle program, some have done it in as little as a week, which blows my mind. But the time until your first sale depends on a lot of factors. One factor is how closely you follow my coaching program, because I will show you the quickest way to setup your drop shipping business. All you have to do is watch the videos and follow along. Now if you want to do it on your own it could take you a year, it could take you 2 years. On your own you may never get your first sale. But I do believe, if you follow along with what I could teach you, that it should take around 1-2 months for you to get your first sale. But who knows, maybe you’ll surprise me like the members who emailed me within a week or two to say they’ve become profitable. is your previous technical skills. Some people have more experience working with websites, so they could do this in a day. If not, it could take you a month for the first time around. I had someone in my coaching program email me recently and it took him months to get a sale with his first drop shipping business. He had moved to Thailand and it took him a long time to get it right. Recently, he wanted to start another drop shipping business. He wanted to move onto a second drop shipping store to increase his income, and he had emailed me about a niche to ask for my feedback on it. And within 2 or 3 hours, he had emailed me back with a link to his new drop shipping store. It was live and it was totally built out. Of course, there wasn’t any traffic going to it. There weren’t actual suppliers that he was approved with yet. But he had built his demo store within a couple of hours. And his first store took him over a month to build. What I’m trying to tell you is that there’s a learning curve and it may take you some time to get it right. But after you successfully build a drop shipping store once, it’s a skill that will stay with you for life and you can just repeat the process over and over. And, if this is a step you want to skip over, we do offer web design packages for those of you that really don’t have the time or who just aren’t getting it. So to answer this question as simply as possible, maybe it’ll take you a week, maybe it will take you a couple of months. It really depends on how closely you follow along my coaching program, and really what your previous technical skills are. I’ve said it bunch of times already, but I really am here to help. So if anything comes up and you get stuck, definitely send me an email and I’m happy to help. In this section of The Ultimate Guide to Drop Shipping, we’re going to talk about where to sell drop shipped products. By this point, we’ve covered quite a bit. If you were totally new to eCommerce and drop shipping before, at this point I hope you’re starting to get a clear picture of what dropshipping is. I hope that you now have a better understanding of exactly how this online business model can work, and what’s possible with drop shipping. Now, let’s get started with the different ways you could sell these drop shipped products. When you start thinking about the different ways to sell your dropship products, it comes down to three options. First is eBay. That’s pretty much everyone’s starter business model when they think about eCommerce. Create an eBay account, make some listings, sell the products. The next is Amazon, it’s becoming more and more popular, but it is still possible to actually list products for drop shipping on Amazon. So that’s an option. And option 3 is having your own store, this is what I do. It’s actually building your own eCommerce store. Let’s talk about why eBay shouldn’t even be an option for drop shipping. First of all, the really good suppliers with great brands aren’t going to allow eBay dropshipping. Whenever you sign a contract and get approved for a new drop ship supplier, 95% of the time it states in the contract that you’re not able to sell on auction websites. Obviously that includes eBay because it dilutes the value of a brand. Good dropship suppliers, the ones you want to work with, are those who truly care about the perceived value of their brand. Great suppliers are not going to approve people only to have them jump on eBay and start selling their products at ‘auction’. That’s not how it works with any good supplier, no matter what the price point of their products or the level of their supplier tier. When it comes to using eBay for drop shipping, don’t even think about it. The next drop shipping option is Amazon. Personally, I don’t drop ship on Amazon. However, I do know quite a bit of people that do it successfully. What I’ll say about drop shipping on Amazon, is it’s risky, because the window could shrink fast and you could get wiped out by an over-saturation of competition. On Amazon, making a lot of sales comes down to who has the best price. Again, like eBay, there’s a lot of drop ship suppliers that won’t even let you sell on Amazon. I do have one piece of advice for drop shipping on Amazon: don’t put all your eggs in one basket. It’s quite common that overnight a bigger player steps in and starts competing with you. But I can’t fully recommend drop shipping on Amazon, especially not as your primary source of income. Though if your store is up and doing well, and you’re looking to scale your business, then Amazon is an okay option for an additional source of income. Still, it’s just my opinion, but you shouldn’t rely on all of your income coming from Amazon. You don’t own your customers. The margins are very low. You can get wiped out easily. The third option is to have your own eCommerce store. This is the drop shipping model that I teach people to do in my course and it is what I always recommend. So let me go through some of the countless benefits as to why I teach this method and why it’s proven to be successful, time and time again. First, you’re not competing solely on the price of an item. When you own your own drop shipping business, you own that platform and data. It’s no longer only about price. Sure, people can find your products elsewhere, but when they’re visiting your eCommerce store, they’re not seeing all of your competitors like they do on eBay and Amazon. They’re seeing your store and your store only when making a purchase decision. The same can’t be said for drop shipping on Amazon or eBay alone. Next, when you own your own drop shipping store, you have more traffic sources available to you. When you’re dropshipping on eBay or Amazon, they already have their own built-in traffic. Some people see that as a benefit to drop shipping on those platforms, but I see it as limiting. In my opinion, what makes owning your own drop shipping store better is having access to certain advertising options that you just don’t get with Amazon or eBay. That’s something that I’m not going to go into much detail now, because the possibilities with paid traffic is a whole other section. However, it’s something I do cover in depth in my Drop Ship Lifestyle coaching program. The next benefit of owning your own eCommerce store is having the customer data. This is a huge drawback on Amazon. You don’t even get your customer’s email address! When someone buys from you on Amazon, you’ll ship them the product, but you won’t know who that person is. But most importantly, you have their email address. And that leads into the next benefit of owning your own store. If you have their information, especially their email address, you can extend the lifetime value of your customer, or LTV. You could have emails automated to follow up with them to offer upsells and add ons. Also, you could send them Holiday promo campaigns, and any other promotional email marketing they might be interested in. Again, this might be a little bit over your head if you’re new to this. But it’s something I do cover in detail in my Drop Ship Lifestyle coaching program! The next benefit of having your own store is that you can implement the changes that your market wants. You can target your specific buyers. On sites like eBay or Amazon, they’re not targeting one specific customer because they sell everything. They are targeting anyone who could purchase anything from them. When you have your own dropshipping store, you can make it super specific and target an exact buying demographic. So, find out who your ideal customer is and make your dropshipping store revolve around them. Making your dropship store highly targeted will greatly increase your conversion rate when you compare to somewhere like eBay or Amazon. Now you can start to understand why I’m such a big fan of recommending that drop shippers start and sell from their own eCommerce store. Just remember, you should never sell on eBay and you shouldn’t start drop shipping on Amazon. So if you want to build your own eCommerce store, how do you actually build it? 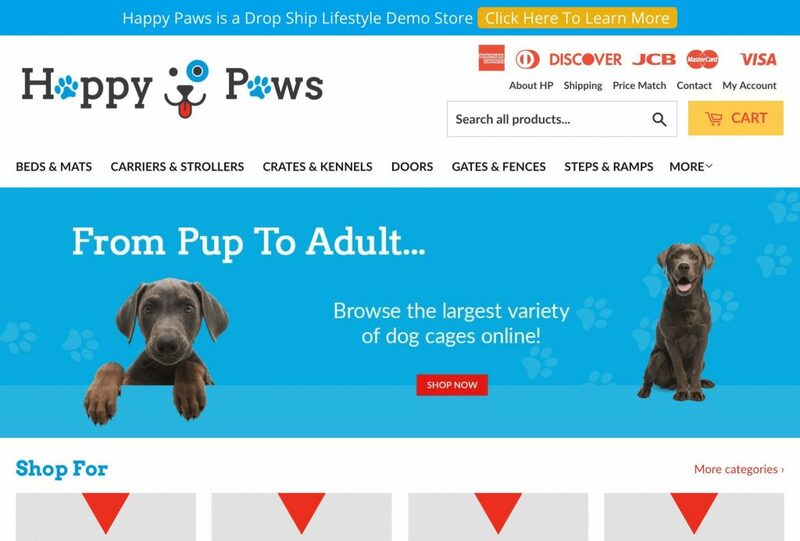 Well these site builders are the 5 most popular options for eCommerce. While there are more out there, these are the 5 you will hear about most. The first is WordPress and you might already be familiar with this platform. Maybe you’ve built a blog on this platform before, and I’m sure you’ve been to WordPress sites countless times. They power something like 60% of all websites online. WooCommerce is a plugin for WordPress that allows you to build an eCommerce store on their platform. Now the problem with WordPress is that it’s self hosted. That means that you’ve to pay for a server somewhere. You have to upload WordPress and WooCommerce, and then you’re responsible for the security. Basically, you’ll need security to keep hackers off of your eCommerce website. If something breaks on your dropship site, it’s up to you to get fixed. Whether that means doing it yourself, or paying someone to fix it. If there’s a problem with your self-hosted WordPress site, no one’s going to just jump in there and fix it for you for free. You host it, you control it. That’s how WordPress and WooCommerce work. Yahoo! Small Business, or Yahoo Store’s, is actually an eCommerce platform that I used when I first started over a decade ago. But now, it’s incredibly outdated. So maybe you hear people still talking about it, but it’s not something I recommend for drop shipping. Magento is a great eCommerce platform. However, it’s for very advanced drop shipping stores. Generally, the price isn’t worth it for 99% of us dropshippers. I don’t use Magneto now, but I have in the past with other drop shipping stores. But for niche specific stores, the ones I teach people to build in my drop shipping course, they don’t need that kind of power. This platform is far too expensive and even harder to customize, so it’s not worth it for what we need. The next option would be BigCommerce, which is a hosted eCommerce platform. That means, they host your drop shipping store for you. So they make sure your eCommerce store is secure and safe from hackers. More importantly, they make sure that your customer’s information is safe. And if anything breaks, the BigCommerce team will fix it for you. Now, I do like BigCommerce but I have one problem: their customer services. When I’ve used them in the past, I had some issues and found their customer service to not be that great. That leaves us at the last option, Shopify. They’ve been around for a few years, but they’re now one of the biggest eCommerce platforms. And simply put, they are amazing for drop shipping. You could easily build an incredibly gorgeous dropship store with them. Drop ship stores built using Shopify are super easy to control and extremely secure. Plus, their customer support is available 24/7 and they never hesitate to jump on a call or live chat to help you. They are more than happy to fix your store or take care of payment processing! What’s great about Shopify is their massive app store. This store has hundreds of Shopify apps that let you completely control how your store looks and functions. When it comes to pricing, Shopify again is incredible. Their plans start at a very low $29 a month. Even if you don’t like paying monthly fees, remember everything they’re offering for that cost. When you’re trying to build a business, spending $29 once a month should not be a concern. Going back, the first option of building your drop shipping store on WordPress with WooCommerce, I wouldn’t use that because of security issues. Just not worth it. I’d rather pay $29 a month on Shopify just for that peace of mind. Next, Yahoo! Small Business is very outdated. Then we have Magento, which is for the massive drop shipping stores and something we don’t need. While BigCommerce is a good option for drop shipping, the customers support is not great and can cause more headaches. So that just leaves Shopify. And hands down that is the winner for me. For now, I wouldn’t recommend any other platform. Now that you know where to sell your dropship products, I’m going to show you how you get suppliers in the next section, “Getting Suppliers: How to Find Good Ones and Get Approved?” And as you know by now, that’s going to be covered in the next section. In this section I’m going to show you how to get legitimate suppliers for your drop shipping business. Here’s how I find good drop ship suppliers and get approved to sell their products. The first thing you want to do is find your competitors. After choosing the drop shipping niche that you’ll be selling in, you’ll want to find retailers that are already in that niche. As I mentioned earlier, there are no good niches without competition. There’s competition because people are making money in these niches. So you’ll want to find your competitors’ websites. To do that, you simply use Google and search for your niche. Then you’ll go through the top results and look through their stores, trying to find out who they’re selling for. Because we want their drop ship suppliers to be our suppliers. So there are a few different ways to find your competitors’ suppliers. If you want a hands on demonstration of competitor research, I do offer that with Drop Ship Lifestyle. You’ll get to watch me (via screen share) visit different websites and different niches to build a list with hundreds and hundreds of drop ship suppliers. As you find more and more suppliers from your competitors’ websites, add them to a ‘Master List of Suppliers’ that you will contact later. Now let’s recap 2 things to stay away from when you’re searching for drop ship suppliers. And unfortunately, a lot of new drop shippers make these supplier mistakes. The first thing I want to mention is why you shouldn’t use drop ship supplier directories. When you search for drop shipping, you’re going to find a lot of dropship supplier websites that say they have millions of products. They’ll charge you an access fee and supply you with a list of drop shipping products. I know a lot of people that make money with drop shipping, and none of them are doing it with these directory sites. These sites are setup to make money through charging fees, so don’t pay for access. Don’t use these drop ship directories. The next thing I want to warn you against is buying a turnkey store, no matter how tempting it is. If you research drop shipping, you’ll find plenty of these turnkey drop shipping stores for sale. Drop shipping products that are overpriced and unsellable. Traffic sources that everyone else uses and won’t work for you, because your prices will be too high. Don’t buy one – no matter how tempting it looks, no matter how good the deal is. Whether it be $500, $1000, or $2000, buying a turnkey store is a huge waste of time and money. None of these sites are going to make you money, do not buy them. Now let’s talk about what’s really important: how to get approved with your drop ship suppliers. So it’s one thing to make a ‘Master List of Suppliers’ in your niche, but how do you actually get approved? Here are some quick tips to help you navigate the approval process successfully. Now that you’ve picked your niche and researched your drop shipping suppliers, it’s time to build your drop shipping store. You’re going to build your store on Shopify before you’re approved with any suppliers. You do this first because no legitimate supplier is going to approve you before they see your drop shipping store. “Hey, I want to sell your products!” – You. “Okay, can we see your website?” – Drop ship supplier. “Oh, I don’t have one.” – You. That’s how you lose potential drop ship suppliers. Without a website, they won’t give you the time of the day. Before you have suppliers, your online store is just a ‘demo’ store. This is so drop ship suppliers can preview your store. They can click around, but nothing will actually be for sale yet. This strategy shows suppliers that you’re serious, and that if they approve you, you have a platform to sell from. When you finally reach out to these drop ship suppliers, be prepared to discuss your marketing techniques and how good your customer service is. You really need to know at least a few marketing tricks before you reach out to these drop ship suppliers. Because again, it’s not their job just to approve everyone. It’s their job to build brands and they need competent retailers to do that. I recommend going through an online course or watching YouTube videos to learn more about eCommerce marketing. That way, when you’re talking to drop ship suppliers and they ask how you’re going to market their drop shipping products, you could at least have a conversation with them. You don’t have to be the biggest expert in the world, but you should understand how eCommerce marketing works. You can learn that again just by Googling it, by going to YouTube, or by working with me in my coaching program. When talking to the drop shipping suppliers, you need to focus on how important customer service is to you. This is something often overlooked by retailers. But it’s something that means everything to drop ship suppliers. Once suppliers approve you and you’re selling for them, you become an authorized retailer promoting their brand. This is why they only want to work with people who are going to treat their customers right. Because it reflects on their brand. How important customer service is to you and your business. That you know how to treat your customers right. That their customers will have a pleasant buying experience with your store, encouraging repeat business. Remember, the goal is for everyone to make money, and for that to happen their customers have to be treated right. And your drop shipping business has to treat your customers right, so that you can make money too. The next thing that’ll help you get approved with drop shipping suppliers is to follow up regularly. The legitimate suppliers aren’t going to approve you right away. Remember, unlike the drop shipping directories, legitimate suppliers aren’t looking to approve as many people as possible. Drop ship suppliers are building brands. So it’s important to sell yourself and your online business to them with your marketing knowledge and customer service. But it’s also important to follow up regularly after the first conversation. To follow up in a month. They’ll get back to me (they never do). That just means that I have to take initiative and follow up with those dropship suppliers. It’s crucial that during the approval phase you keep excellent notes with everyone you speak to. If they say to call back, know when you’re supposed to call back. If they say, they’re going to send you something, ask them when they’ll send it by and if they don’t, make sure you follow up. It’s your responsibility to make these supplier approvals happen. These 3 steps are going to have a huge impact on your overall sales and how well your drop shipping business does. They are huge part of running a drop shipping business. Make sure to get it right by building an online store to show suppliers, know how you’ll market their products, and follow up afterwards. So that’s going to do it for this section. In section 7 I’m going to cover how to handle your drop shipping products and how to answer questions from your customers. When I say something like, “I’ve sold millions of dollars in products online that I’ve never seen or touched”, it seems a little weird, right? Not holding an inventory brings up a lot of questions for those just starting their drop shipping business. In this section, I’m going to answer some of the most common questions about selling drop shipping products. ​If someone calls or emails you with questions about the products on your drop shipping store. How do you answer them? Answering your customers’ questions may seem tricky at first because you likely know very little about your own products. Most likely, it’s a product that you’ve never seen and have no experience with. If you’ve never physically held or seen the product that you’re drop shipping, it’s going to be very hard to answer your customers’ questions about those products. So what do you do? All you have to do is explain to them that you’re going to contact the manufacturer and get an answer right back to them. This does two things for your dropship store, it gives them the correct answer but it also builds trust with your company because you’re taking the time to get the answer right. Sounds simple, right? It works because your customer will feel appreciated. Potential customers are more than happy to wait for the right answers. Drop Shipping Hint: Have a phone number on your website. I’m a big fan of having a phone number on your eCommerce store, especially if you’re following my advice and selling expensive items. The customer will want to call in, they want to talk to someone before swiping their credit card. I held off on adding a phone number to my dropship stores for a long time. Mainly because I was afraid that I’d be in a situation where I couldn’t answer the customer. But as soon as I put my phone number on my site, my sales saw a huge boost. It was the best conversion optimization tweak I’ve ever made. Don’t be afraid to find the answers for your customers’ questions, and of course, add a phone number to your dropshipping site. That’s how you can handle customer questions and build trust at the same time. Nobody wants to have a drop shipping business that sells bad products, that usually means a ton of returns and unhappy customers. You want to dropship high quality products, but here’s the catch… If you’ve never seen or touched your products, it’s hard to really know if they are high quality. Before I sell for a new drop ship supplier, I look for product reviews. Reviews like the ones I found for this paddle board supplier. Checking product reviews is a great way to ensure you’re dropshipping a high quality product. All you have to do is search for their company on Google to find reviews of them and their products. This is the easiest way you could screen for those low quality dropship suppliers. Doing this will give you a huge head start and help you avoid selling low quality products with high returns. How do you handle returns? But also how do you answer questions about returns? This may be something you’re nervous about when you first start off in eCommerce. But like I said in a previous section, how you handle returns is based on your supplier’s return policy. Then review your supplier’s return policy and figure out if there’s a restocking fee or if you have to handle the return shipping. You’ll just need to go through the process that your drop ship supplier laid out. It’s worries like these that hold people back from starting their drop shipping business. A lot of people want everything figured out before they start, but the truth is, that you can learn as you go. And if you’re not willing to do that, then there’s a good chance you’ll never be successful in business. Because being successful is all about learning things as they happen. How do you know if a product is in stock? If a customer calls and says, “Hi, I want to order this $2,000 item. I just wanted to make sure it’s in stock before I placed my order.” How do you answer them? This is a very common question when you’re drop shipping expensive items. Customers don’t want to spend their money unless they’re completely sure the product is going to be shipped to them quickly. However, answering this question will differ based on your drop ship supplier. Many drop ship suppliers will provide a link to their weekly inventory report, something like an Excel spreadsheet. In it, you will be able to see how many items are in stock. If you aren’t given a spreadsheet, the supplier may have an inventory report on their website. In these cases, suppliers will provide you with a login so that you can see if products are in stock. You can take some time if that means they’ll get the correct answer, especially if you are selling more expensive items. ​How do you know when a product will ship? When a customer buys a product from you, how do you get the tracking information for them? What happens after you’ve received their money? Good drop ship suppliers will automatically email you with the tracking number after the order ships from their warehouse. Then you can input that tracking number into Shopify so your customer knows it’s in transit. Instead of waiting for a customer to request it, you could also be proactive about order tracking. Personally, I keep different spreadsheets with orders and notes. What’s Included In Your Proactive Order Tracking Sheet? Do you have a tracking number? If not, who do you follow up with? Who’s the drop ship supplier? Again, there’s nothing wrong with telling your customers that you’ll get back to them with an answer as soon as you can. What do you do if your customer wants to place a bulk order? This doesn’t apply to every niche but you may run into this unique problem. Some of my drop shipping stores have received $65,000 orders, which is insane for one order on any eCommerce store. This is obviously not something where the customer will go to your website, enter the credit card number and that’s it. The customer will call in and tell you why they want to buy in bulk. It’s also likely that they’ll want some type of discount since they’re buying so many products. And of course, you can offer them a discount, but how does that process work? What do you do? Well, first thing that you want to do is contact your supplier. You want to make sure that they have enough inventory or find out when they will have enough. You then want to negotiate a price with your dropshipping supplier. If someone’s going to order $60,000 worth of products and your wholesale cost is something like $30,000, you’ll want to get a better profit margin. You want to get paid for the extra work of pulling off such a big sale. Since many credit cards don’t have very high limits, the last step is setting up a wire transfer with your customer. Plus, an order of this size would probably flag your credit card merchant account if you tried to process the order. When someone wants to place a bulk order, just ask them how many pieces they need and when they need it. Then tell them you’re going to put together a custom quote and get back to them. While you’re creating that custom quote, talk to your drop ship supplier. Negotiate a deal with them and make sure those products are in stock. Now that I’ve covered some of the basics of dealing with customers, let me give you a few bonus dropshipping tips to wrap up this section. There are a few different ways to add content for your product pages without ever seeing or touching them. The first thing I recommend doing is searching on YouTube for product reviews. There are a few kind of videos that people make for products. General reviews where they walk through benefits and downsides of a product. Unboxing videos, where they unwrap a product for the audience and share their first impressions. Videos comparing products in the same category. All these videos are a great way for you to get some extra content to add to your website. I’m not saying you should take their videos and put them on your website. But if you are drop shipping an item that has a video review on YouTube, try to pick out the best parts of the content and add that to your website. Another tip to get some unique content for your dropshipping website is to attend industry trade shows. If you’re drop shipping chandeliers, you should attend lighting trade shows. Not only to meet your suppliers and get new ones, but also to take photos of the products. And all of these photos you take at the trade shows will be unique to you! Now you’ll be able to add unique photos that don’t all look the same to your drop shipping pages. Attending industry trade shows will not only give you a chance to see the products in person, but it will also give you valuable content for your drop shipping business. Another tip for sourcing great content to add on your drop shipping website, is to ask previous customers for images. If you’ve already made some sales, you should be reaching out to your customers. Not only to get testimonials for your store, but to also have product images from actual customers. Again, this will add some unique content to your website, which will help with your conversion rate. Because it will make you stand out from your competitors. I hope this showed you how you can sell products that you’ve never seen or touched. In the next section, I’m going to talk about how you get your drop ship store noticed. That means bringing people to your store and actually making sales! Once you have your store built and your drop ship suppliers secured, how do you get people to visit your drop shipping site? This section will give you a brief introduction to some of our traffic sources and how they work. That way you can drive the best traffic to your drop shipping store. I’ll also show you how to mentally approach traffic as an eCommerce store owner. Before I dive into our traffic sources, I just want to make it very clear how you should approach traffic. First off, you don’t need all the traffic in the world. A lot of people when they build a website think they need thousands of visitors a day. Some people even get caught up with the idea of competing with Amazon and their millions of daily visitors! But you don’t need Amazon level traffic to be successful, because you’re not trying to compete with everyone. All you’re trying to do is get enough sales to reach the income goals you’ve set for yourself. If you want to beat Amazon, I can’t help you. If you want to build an online business that’s profitable, I can help with that. In order to succeed with your drop shipping site all you need is buyer traffic. For example, let’s say you had a thousand people visiting your drop ship site every day. That’s a great number, but are they looking to buy or are they just random people who stumbled upon your drop shipping site while searching online? You don’t need a thousand visitors a day to make money. You don’t even need a hundred visitors on your drop shipping site a day to make money. Sure, it’s ideal but that metric shouldn’t be your main focus. Instead, you should be focused on getting visitors that are ready to buy. For example, let’s say you had 10 people come to your drop shipping site every day and those 10 people were buyers. They found your site, and they’ll pay a $1,000 for your drop shipping products. With traffic like that, you could have a very successful drop shipping business. It’s probably not going to work out exactly like that. But just so you know, you don’t need all the traffic in the world. You only need visitors that come to your dropshipping site because they actually want to buy your products. There are a lot of different ways to find buyers for your drop shipping site. Honestly, I could spend hours talking about traffic and how I use it with Drop Ship Lifestyle. But for now, I am going to show you some of most common methods of attracting buyers to your drop shipping site. 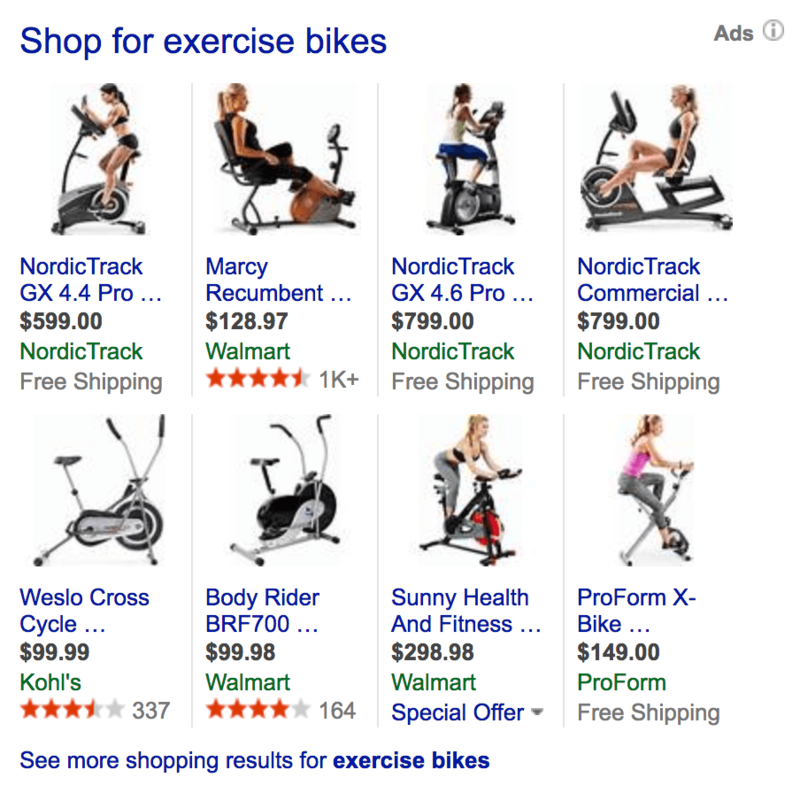 Google Shopping is a very, very targeted source of buyer traffic if you use it right. That’s because it’s people searching for specific products. They see the ad, the price, and a link that takes them right to that product. It’s great traffic for bringing buyers to your dropship site. Facebook Ads for eCommerce can be pretty tricky. It’s great for re-targeting, meaning if someone comes to your eCommerce store and they don’t buy anything, you could show them an ad on Facebook with your store as a reminder. For new traffic, Facebook can work, but it’s a much longer sales process. That’s because If someone finds you on Google shopping, they were searching for the product that you’re advertising. If they find you on Facebook Ads, it’s because you’re trying to target them with an ad for your drop shipping store. So the person on Facebook isn’t proactively searching and ready to buy. Meaning, traffic from Facebook ads isn’t made up of buyers. But Facebook Ads still can work if you build a sales funnel to turn them into buyers. The next thing you should do for traffic is use Pinterest. Pinterest is great for eCommerce because it gives your drop shipping site a ton of traffic and it’s free. Pinterest also has paid advertising, but even with just organic pins Pinterest drives a lot of traffic to your drop shipping site. And they even allow you to sell your dropship products through Pinterest, linking directly to your Shopify store. Search engine optimization (or SEO) is something I could speak about for hours and hours. But I’m just going to say that with your drop shipping stores, it’s not that hard because you aren’t trying to rank for generic niche keywords. You’re ranking for specific dropship product titles. So it’s very easy to rank for something like a manufacturer name, product name, or SKU number (stock keeping unit). Because again, we’re not going for those top level, super competitive keywords. We don’t want that super competitive keyword traffic, because it’s not ‘buying’ traffic. If someone searches for chandeliers and they find our store, that’s great, but chances are they’re not yet ready to buy. If they search for the chandelier company manufacturer name, product name or SKU, there’s a good chance they’re much further along in the buying cycle. That means we have a much better chance of turning that visitor into a customer. And that’s how we use search engine optimization for our drop ship stores. Again, this is something I go into much more detail within my Drop Ship Lifestyle coaching program. There, I actually show you videos of how to set this all up so you can get the best results. The next thing you could do is write guest blog posts. That means you find blogs that are relevant to your niche and share information on them. Most of the time, the owner of the blog will link back to your drop shipping site. This will help you get noticed by blog traffic and search engines. The next thing you should do is take out banner ads on different blogs that are in your dropshipping niche. Simply rent some advertising space, create a little graphic to be placed on the blog and people will click it. It’s a great way to get your drop shipping store noticed. The next thing you could do is a gift card giveaway. So if you’re selling expensive items, like I recommend, your profit margin per sale should be relatively high. That means you can afford to give $25-$50 off per order. A gift card giveaway is something that works really well, especially when launching a new drop ship store. Run a promotional contest for $50 gift cards that are valid on purchases of $1000 or more. So if someone spends over $1000, they get a gift card that gives them $50 discount. You still make a great amount of money and it’s a great way to drive people to your store when you’re first starting. These are just a few traffic sources that I use, I could go into much more detail about them. Module 7 of our “Drop Ship Lifestyle” coaching program is all about traffic. So if you want to know more about this, I highly recommend signing up for it. Now that we’ve covered some of the basics about getting traffic to your drop shipping store, let’s talk about the most important part of the equation: lead value optimization. What’s really important is converting your traffic into sales. Taking a visitor, having them go through your checkout page and order from you. There are so many different ways to do this, but it’s called lead value optimization. Which is getting a lead that comes to your site and getting the most value out of that visitor. How do you make as much as possible from everyone that visits your site? ​This is something that I cover in great detail inside my coaching program. In this next section, I going to give you a sneak peek into the Drop Ship Lifestyle 7.0 members area. I’m going to take you inside the coaching program and show you some of the modules. Now that I’ve answered, “what is drop shipping?” – It’s time to give you a tour of my course Drop Ship Lifestyle. The newest update, 7.0, has some massive improvements that should make your drop shipping journey much easier. The update comes with brand new resources, course updates, and an easy to navigate members area. Check out everything new here. 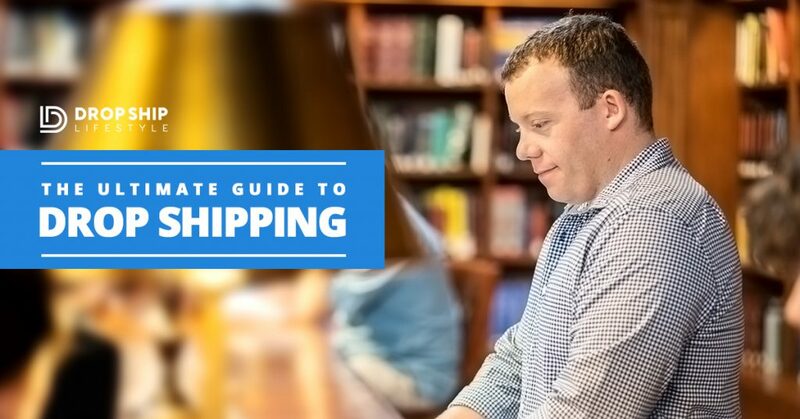 Now that you’ve finished The Ultimate Guide To Drop Shipping, you may have some questions. ​Drop ​leave them below and I'll help you out! What’s the first thing I need to do to get started? also what is the price? thanks! If you’re brand new to eCommmerce and to Drop Ship Lifestyle, I would recommend that you get started with my free webinar! Hey Anton, I’ve been looking at starting my own drop shipping business and will be attending your training this evening, really looking forward to it. I know the time is right for me to make the move into my new venture. Happy to have you on board, Lorraine! I live in Canada, I have no idea how I can open a drop shipping business. I heard about shopify but I am not sure how to start. Can I start my shopify store? how long does it take to build a profitable store. and how much it does cost. I cannot (legally) make any income claims, but you should check out my webinar. Also, this model works great in Canada. We have many successful students from there. Thanks for the info here. I had a shopify store before but wasnt that successful was using the aliexpress model with facebook ads as traffic driver. Correct me if I am wrong, but according to your method the supplier should not be from china (rather straight from the USA for example albeit will be charging higher prices for their items) and for driving traffic Google Shopping should be the #1 source whilst FB is better used for re targeting people who already visited your page via google shopping? I’m currently living in Lebanon, I would like to open an eCommerce business here. Do you know if this specific Dropship Class is applicable in the Lebanese market? I don’t know of anyone drop shipping in Lebanon… however, we have members from over 25 countries. Many of them are drop shipping in their own countries, and many are drop shipping in the U.S. from abroad. Where do I go to get your training on Drop Shipping and what is the cost? Feel free to email anton[at]dropshiplifestyle.com if you have any questions. To clarify, I live in China and want to drop-ship to the Chinese market. I would like to Drop-Ship goods made in China, to the Chinese Market. I have the ability to pretty conveniently go meet a Chinese supplier myself. Foreign goods are also on my mind as middle class incomes are rising, but I see your point about the transit issues- in the short run, maybe this isn’t worth it. Anyway, in this context, would you still advise against China? Is this possibly a relevant business model for me? I’m currently living in China, I would like to open an eCommerce business here. Do you know if this specific Dropship Class is applicable in the Chinese market? I’m personally not aware of any drop shipping in China, sorry! I see. This market seems premium since so many sales are based on personal relationships and trust. One last question, should I take a course in Digital Marketing before I start your course? Great Information Anton thank you. How does one manage sales tax issues when drop-shipping products in the US using US drop-shippers, given that every state has a different rate? I don’t live in US so, does this complicate the tax process even further? Our S-Corp is registered in NY so we charge sales tax on orders that ship to NY. However, that’s not advice for what you should do and I’d highly recommend talking to a CPA regarding anything tax related. Hello. How much money should I have to start dropshipping on shopify including monthly payment,ads and marketing and things like? And what if I don’t make sales and lose money first month? Here’s a blog post I wrote about startup costs for drop shipping. I don’t know how long it will take you to make money because it’s different for everyone (you’re starting a real business), but I can say that we’ve had many students start making sales within 21 days. Thank you so much for all the info that you are sharing. I am a working mom and I am really hoping to have my own business so I can spend more time with my family especially my daughter … this is why I started reading & watching about ecommerce. Your website is amazing, you are amazing! I appreciate that MJ, and I wish all the best for you and your daughter 🙂 Stay motivated and focused and you’ll make it happen! Iam a student now and i have a full-time warehouse jop, I wanted to start an online business of my own, this beautiful honest information will help me to make a good decision on where, how and when to start it. Thanks agian and see you on the other side. If you follow my system and focus on selling expensive items (from domestic suppliers) with Google PLAs being the main traffic source then your Shopify design knowledge should help you get up and running a little faster. Question I have seem people using 3dcart and there is also lemonade stand have you heard of these hosted shopping carts? Great question, Avi. The truth is that there are DOZENS of different hosted carts out there. The big players (in 2017) are Shopify, BigCommerce, Magento, and Volusion. When you compare them all side-by-side for cost of use + features offered + support Shopify wins hands down. I haven’t done a comparison video for years but I may do one in the near future. For now, just know I’ve tried almost every platform out there and Shopify is the clear winner. I must say that I don’t quite agree with you about not working with Chinese suppliers, I’ll explain. If we just think a moment we’ll remember that almost our everyday use are Made in China. Our computers, phones, clothes, shoes, bags, cars, TV and much more. I do not need to go any further, you know what I mean. I think that what used to be thought in the past, is no longer the same today, with the same fear of defective or non-quality products, you can also get from large companies in the US or Europe. Nobody can guarantee you anything. There are a lot of good and reliable suppliers in China, all we need to do is find them. And I think that “Oberlo” is doing a lot for us in that matter. This is my opinion after I learned a lot and read a lot about DROPSHIPPING, now it’s my time to implement. Having said that, I thank you so much for the great stuff you share with us. I have no problem at all with products that are made in China. In fact, I’ve imported dozens of containers over the years and seen excellent quality manufacturing from reliable suppliers in Shenzhen. My issue is with blindly drop shipping random products from China from suppliers with whom you have no real relationship. As stated in the post, this often results in inconsistent quality of product + long lead times for your customers. I go into more detail on this in my drop shipping from China video. Nice tips to avoid bad suppliers. But my question is that after removing supplier how we can find the real one because most of the guide & guru recommenced supplier which some how falls in the above mention category of yours. I would love to hear a solution on that? Glad you find it helpful, Osama! If you started with bad products and/or bad products the first thing you could do is try to find better (Silver & Gold) suppliers within your current niche. However, if these suppliers are not available in your niche, I would just recommend starting over. I know that MAP is essential for the products, but does Oberlo have MAP? If it does, I’ve just not seen it yet. Or is that the price they have listed as the price I pay them to ship it? That is correct. MAP is a HUGE part of the reason why we can maintain such high profit margins when drop shipping. With that being said, I highly doubt any suppliers on Oberlo offer MAP pricing. This is one of the many reasons why we do not drop ship from China. You can learn more about that in this video. One question, but I’m feeling everything in this post is what you get as they may be part of the course. About finding the right manufacturers to do drop shipping with, as this can be very very tedious. Yes, finding suppliers is part of our Drop Ship Blueprint program (it’s covered in Module 2: Market Research). With that being said, the hard part is finding the right suppliers (the ones you can actually make money with). I call these Gold and Silver suppliers. If you are a member of Drop Ship Lifestyle you can learn more about how to get in approved with these suppliers in Module 4: Supplier Approvals. You mention only the big guys eBay, Amazon, Shopify and many others you skip . Just an educated opinion …. What do you think about Instant Ecomm? I’ve never heard of them so I cannot say anything good or bad… what I will say is that I’ve tried all of the big eCommerce platforms over the past decade + of selling online and no one compares to Shopify. If you’re enrolled in Drop Ship Lifestyle I’d highly recommend checking out our Adwords 2.0 PPC Course along with our Paid Social Traffic Course. If you want to learn directly from me I would highly recommend enrolling in Drop Ship Lifestyle as soon as we open v6.0. I’m currently creating the new training but if you get on my email list I will email you as soon as it is ready. If you’re willing to do the work I’m sure you’ll succeed! If you’re new to drop shipping & Drop Ship Lifestyle be sure to check out our free “What Is Drop Shipping?” Mini-Course. As many of you already know, I created Drop Ship Lifestyle after selling a network of eCommerce stores and then trying to find a community of other store owners to network with… What I found was a bunch of scammers who promised newbies they would get rich quick by following their push button systems! This led me to create a new community along with online training that shares how to build a REAL online business. I’m going through your mini 10 video course and may I say it’s fantastic. I’ve been dabbling with dropshipping on EBay UK and find that most EBay customers just want a cheap deal. Successful sellers are selling thousands of their items and are only making a few pence or £1 per sale and I don’t want to compete with these. Should I start off selling higher priced items on EBay UK in the right niche, maybe connect listings to my Shopify store (have not got one yet) if EBay UK allows this, or should I go ahead and create my first store and sell only from there?Ebay seems to be saturated. Happy to hear you’re loving the “What Is Drop Shipping?” mini-course! Regarding selling on eBay – this isn’t something we don’t do (and haven’t done) for the better part of the past decade. IMO you’re much better off selling through your own store (I use and recommend Shopify) and driving your own traffic. We use lots of different traffic strategies but our highest converting source of traffic is still Google PLAs. Also, here is a link to a video I made about drop shipping on Amazon. I mention eBay on there as well so you can see why we no longer sell on their platform.